VOKRA works with all kinds of people throughout the year. We cooperate with other rescue organizations, with our volunteers, with community members and business owners. But this year, we worked with somebody really special; the big guy himself. That’s right, we know Santa. 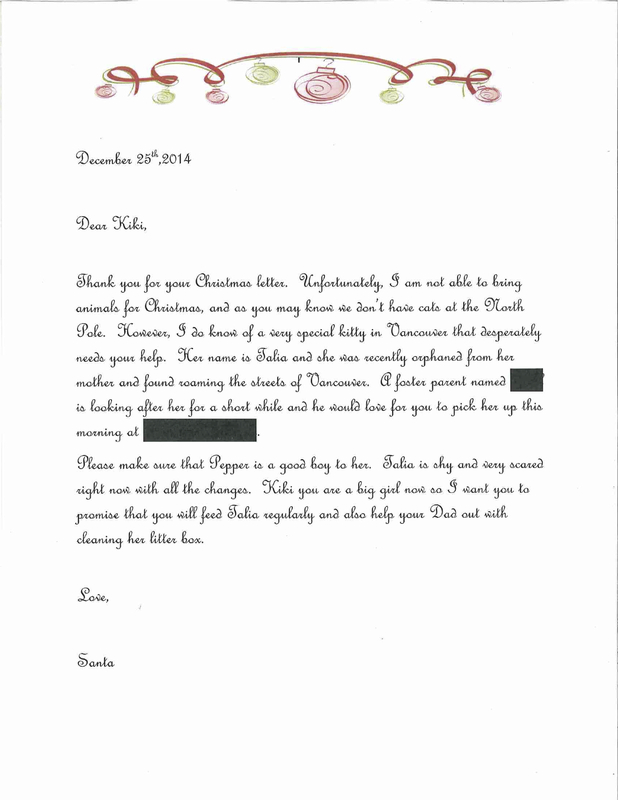 An awesome little girl named Kiki had a very special request for Santa this year. While other kids asked for Frozen dolls and Minecraft games, Kiki had something different she wanted. Pretty great, right? Yup, pretty great. But it gets better. You see, when Santa received her letter, he knew exactly what to do. It just so happens that Santa understands how many cats need loving homes and the importance of “adopt don’t shop”. He wanted to find just the right buddy for Kiki. So he got in touch with us. Come Christmas morning, lucky little Kiki found a very special letter waiting for her. I mean, we knew Santa was cool but he knocked it out of the park with this one, didn’t he? So, Kiki and her family went to Talia’s foster home on Christmas Day where there was yet another surprise: Talia had a brother, George, who would be joining Kiki’s family too! Talia and George said goodbye to their VOKRA foster, who had taken excellent care of them while they were waiting for their forever family, and headed off to their new home. Merry Christmas indeed! 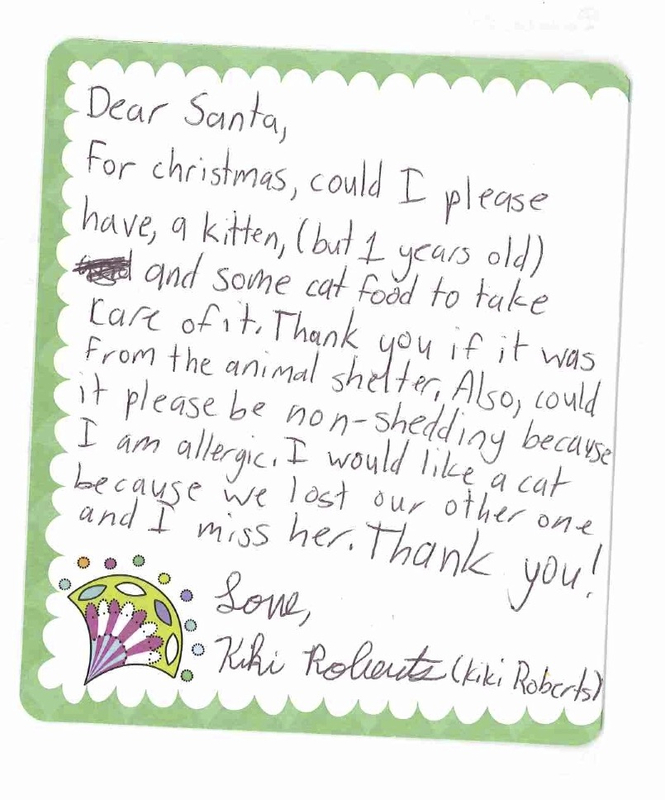 We are so happy that we could help Santa make this Kiki’s Christmas wish come true and that he helped us find such a wonderful home for George and Talia. We hear George is making friends with the family dog, Pepper, (you make friends by swatting someone on the nose, right?) and that, despite being nervous for a few days, Talia is now happy to be home. According to Kiki’s dad, Talia and George “are both part of the family now”. We know Kiki will take good care of her new furry friends because, as already established, she’s an awesome kid. And Santa, well, he proved, once again, that there is magic at Christmas. But we would be remiss if we didn’t mention how great Kiki’s dad, Jeff, is too. 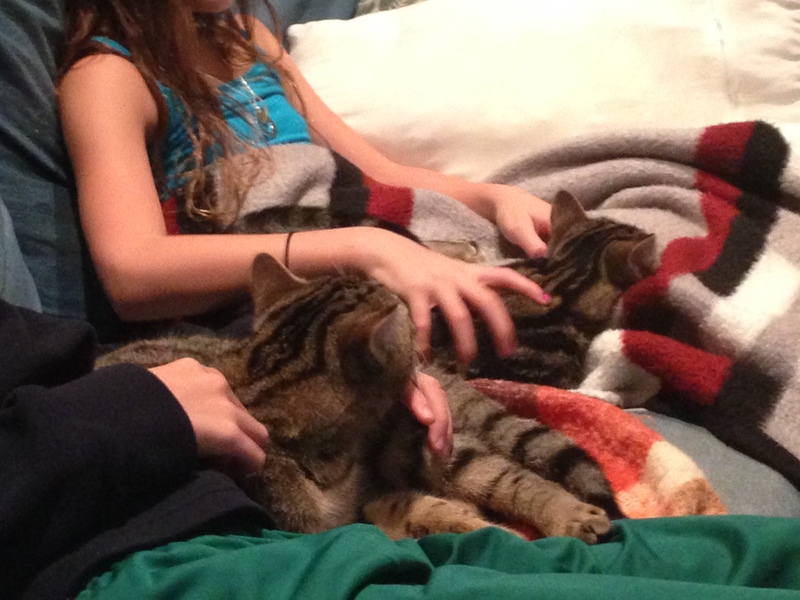 After all, he drove the car to pick up the new kitties and bring them home. Welcome home, George and Talia. What a wonderful family you’ve joined. We wish you all health and happiness for many, many years to come.